Organize your promotions, important information, images, other widgets in tabs using the Homepage Tabs Slider extension. The module creates a responsive tabular interface that you can insert into Homapage, or any other CMS page or static block. Ideal for mobile and desktop themes. You can create a set of tabs to be displayed for your customers in munites. Tabs are edited using WYSIWG, widgets allowed. 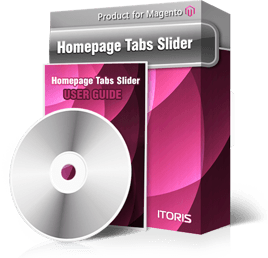 You can combine Homepage Tabs Slider with another module - Homepage Product slider, and create several tabs of products organized in the sliders. Thus providing your customers with all your best products and still save a lot of space for other information. Tabs can be switched on click or mouse hover. There are a few great sliding effects available. All tabs can be loaded together (SEO friendly) or after clicking on them (Traffic friendly). Create tabs for ceratin customer groups if needed. Have different tabs for different store views. Limit tabs' display on time (from-to dates). Reorder tabs directly in the list. Create as many tabs instances as you wish, each having its own set of tabs. Set fixed or automatic height to tabs.